Pepper is a humanoid robot that has been manufactured by SoftBank Robotics. The robot is designed with the ability to read human gestures and emotions, analyze them and react accordingly. 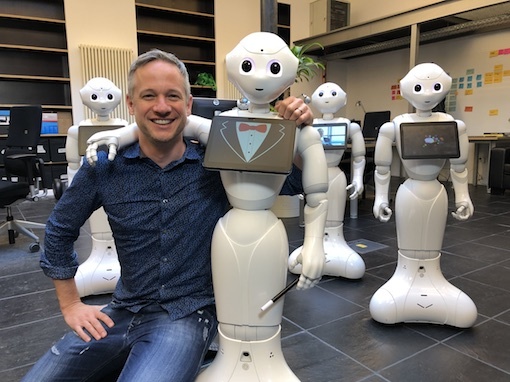 Pepper is a personal robot and intended to enhance relationships between humans and robots. Or should I say: between magicians and robots? Pepper loves magic and how humans react to it. So he wants to learn the craft himself and asks Simon, the iPad magician, to be his teacher.Together they explore the (im)possible. Pepper makes predictions, learns to solve a Rubiks Cube and levitate objects. Over a 100 million people have seen my magic on YouTube and there is no press release without the word “iPad Magician” next to my name. Of course thanks to Apple’s tablet computer I enjoy an excellent reputation and was even invited to the Ellen DeGeneres Show in Hollywood. Although “Digital Magician” might be the more accurate job title: 3D printers, Augmented and Virtual Reality, Drones, Holograms, Smartphones and Smartwatches and now even Robotics are a part of my magical creations and I am myself excited to see which technologies of the future will become a part of my shows. Until then I am looking forward to meeting you personally on one of the stages in this world. Maybe alone, but maybe already with my new and magical assistant: the robot Pepper.